Business continuity describes the processes and procedures an organization must put in place to ensure that mission-critical functions can continue during and after a disaster. Business continuity, disaster recovery, and backups - these are topics that, for many organizations, slip through the cracks of day to day operations. The level of protection you think you want may not reflect what your organization really needs or can or can not afford. Business continuity, disaster recovery, and backups are only a lower priority for most companies until something dire occurs. At Digital nGenuity we would be pleased to discuss the various levels of complexity involved and help you determine what you will get for your investment. To really understand the topic, first you must define the terms, which have become rather confusing. Data backups are central to any disaster recovery plan but certainly do not make a DR plan. An audit of backup processes determines if (a) they are effective, and (b) if they are actually being implemented by the involved personnel. 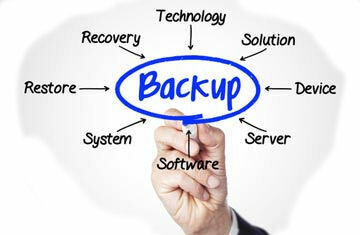 In many cases a server will go down and the backup will not work as the backup plan was not followed. This presents a painful situation, but generally is not completely unrecoverable. Good quality backups are the minimum any organization requires. The continual effective backing up of data and systems can help minimize the impact of threat. Business continuity describes the processes and procedures an organization must put in place to ensure that mission-critical functions can continue during and after a disaster. In this sense, the concept is interchangeable with disaster recovery plan (DRP). Business continuity, however, also addresses more comprehensive planning that focuses on long term or chronic challenges to organizational success. Potential business continuity problems may include the illness or departure of key team members, supply chain breakdowns, catastrophic failures or critical malware infections. The relationship between the three. Business Continuity and Disaster Recovery are closely related practices that describe an organization's preparation for unforeseen risks to continued operations. The trend of combining business continuity and disaster recovery into a single term has resulted from a growing recognition that both business executives and technology executives need to be collaborating closely instead of developing plans in isolation.